Welcome to Day #3 of Chocolate and Costa Rica Theme Week. Today's Costa Rica 82% Cacao Extra Dark Chocolate (ORO) bar was from Sibu Chocolate (San Isidro, Heredia, Costa Rica). This was the first of four Sibu bars to be sampled this week. This three-ingredient** bar had a pleasing dark chocolate aroma with quiet, but lush, green notes. The flavor was very smooth and slightly sweet for an extra dark bar, with a very slight fermented milk note and a hint of balanced coffee in the aftertaste. Great flavor for little sugar. 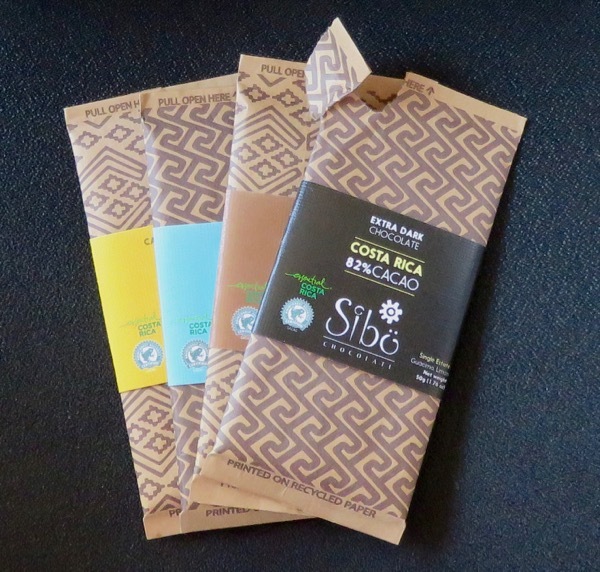 The cacao used to make this bar was sourced from a Rainforest Alliance Certified Cacao farm and single estate in Guacimo, Limon (located on the Atlantic/East coast side of) Costa Rica. *Cacao grows in a band 20 degrees north and south of the Equator. In the U.S., Hawaii, is sometimes referred to as the north pole of cacao growth—located between 20-22 degrees north of the Equator. It is the only U.S. state where you're likely to see cacao grown commercially.